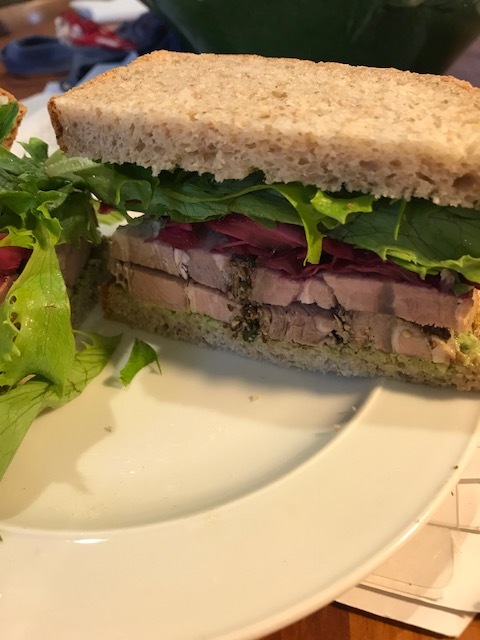 While I’m recovering still I’ve found I have to simplify food/recipes as Mike’s my assistant and if I make things too complicated it gets too difficult. So following is a slow roasted piece of lamb we both found easy and thoroughly enjoyed eating. There was too much for the two of us so I had some cold for my lunch sandwiches. 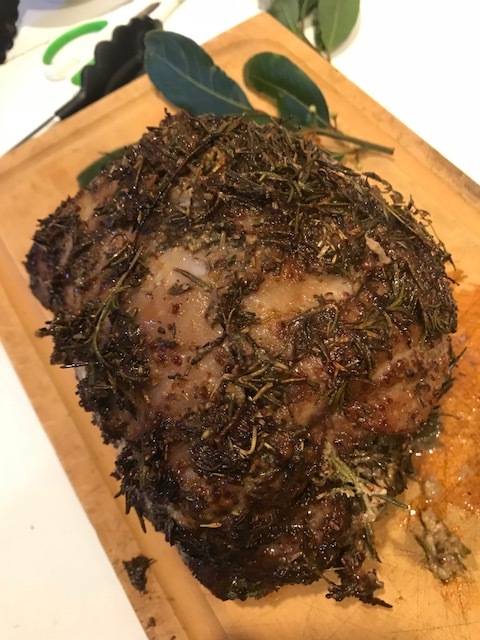 At least 24 hours before you intend to cook the lamb, mix together in a small bowl both mustard, honey, cayenne, crushed garlic, herbes de Provence, fresh rosemary leaves and salt & pepper. Open up the lamb and coat both the cut flesh side with the mixture. Grind fresh pepper over it. 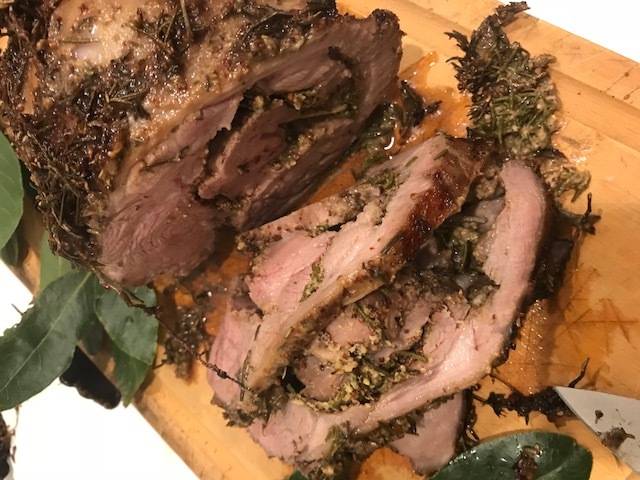 Place the pieces of rosemary and thyme in the middle of the lamb lengthwise on the flesh side and roll it up loosely. Tie the lamb to hold it closed – don’t use plastic string, use paper twine. Place on an oven dish and if you have anymore, sprinkle fresh thyme, rosemary and Herbes de Provence over the outside. Cover and pace in the fridge to marinate. Next day heat your oven to 150-160c. Place the lamb in an oven dish and add the stock or water and wine. Cover it loosely with foil and place in the oven. Baste it with the pan juices occasionally. If the liquid runs out add more water and/or wine. Cook for 3-3.5 hours removing the foil for the last hour. When ready remove the lamb and rest it for a few minutes. Sizzle the remaining juices quickly on the stove. Add a little more stock or wine if necessary. This becomes the gravy. Cut the lamb into thick slices and spoon over some of the hot juices.